While my cousin Nick and I are touring Turkey, there’s sad news from the family back home. My aunt Virginia has died. This wasn’t unexpected — Virginia was fading for a long time — but it hurts nonetheless. Virginia was the last of my father’s family still alive. More than that, she was a great person. On Christmas Eve 1958, I had been married two months and seven days. We were sixteen and eighteen — young but in love. Pop had a good job in a mobile home factory. The pay was $2.10 per hour. They gave him a week off for our honeymoon. On Monday morning, ten days after we were married, he went back to work, worked three days and was laid off for the winter. We had no groceries in the house because we were waiting for payday, so the first thing we did was go shopping. The cupboards were bare, so we needed everything. The total bill came to $28. That included flour, sugar, butter, bread, lunch meat, and all the spices, plus whatever else one needs to stock a cupboard. Through the fall and early winter Pop worked at odd jobs for his dad, who was self-employed buying wool, cow and deer hides, cascara bark, beaver pelts and other furs. Pop and a friend also cut wood for my dad. Dad paid them $6.00 a cord, and by splitting it two ways they each got $3.00 per cord. We stayed with my folks about five or six weeks during the time he was working for Dad. Eventually, we went back home and Pop started working for his brother, who was a trapper. Pop’s job was to skin the beaver and stretch it tight on a board, in a circle (like a woman would a doily), and hold it with nails around the outside of the circle so it would keep its shape. When the pelt was dried it was in a stiff circle. Pop was paid $3.00 per pelt when it was done. The day before Christmas — December 24, 1958 — Pop went to work. We were broke as usual. It was Christmastime, but we had no money for gifts. It was our first Christmas. I don’t remember what time he left for work, but he completed two pelts making $6.00. Rushing, he managed to get home by 4:15. The stores closed at 5:00 on Christmas Eve. By the time we got to town it was 4:30. He gave me $3.00 and he took $3.00, and we went shopping. I bought him a pretty shirt. He bought me a beautiful lamp that hung on the wall. So was our first Christmas. We were young and in love. We had each other, and who needed fancy gifts? Virginia and Stan had nine children. My cousins include Robin, Tammy (familiar to many long-time readers), Gwen, Laurie, Valerie, Scott, Ted, Mart, and Ben. In March 2003, the last time I tallied the numbers, Virginia had 49 grandchildren. I’m sure that number is higher now, and that she probably even had great-grandchildren. Like many in the Roth family, Virginia was an entrepreneur. For a long time, she operated a catering business out of her home in Estacada. She baked wedding cakes and catered weddings (including the wedding of my brother Jeff and his wife, Steph). She (and her family) actually catered more than just weddings, but that was the mainstay of their business. 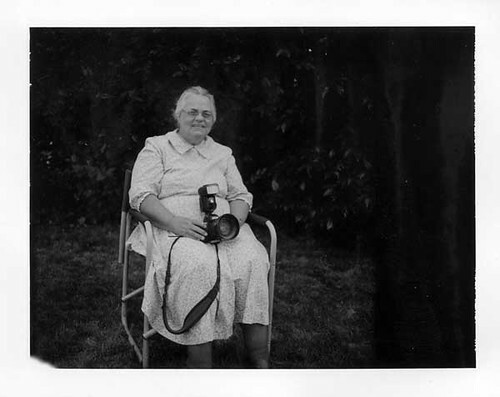 But Virginia also loved photography, and that eventually became her staple business. She traveled the country making beautiful photos, which she sold to companies for jigsaw puzzles and calendars and postcards. 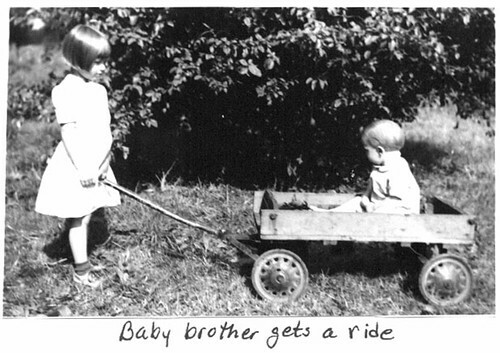 She also created her own line of successful cards featuring these photos — many of which included her grandchildren — and sold the cards at stores and gift shops throughout the northwest. Above everything, Virginia was a Christian woman, and I mean that in the best possible way. Many Christians aren’t very Christ-like. But Virginia was. For this, I always respected and admired her. She was warm and caring and loving and kind. I always felt welcomed by her, even though I knew that my choices were vastly different than the ones she would make. My aunt Virginia was good person. A great person. As I said, Virginia’s death wasn’t unexpected. In fact, the family has been preparing for this for almost eighteen months. In June of last year, my cousin Mart brought me two boxes of slides, a cassette tape of hymns, and a script. Virginia had composed a slide show (set to music) featuring her own photographs. She wanted it shown at her funeral. I converted the tape and slides to DVD and the presentation up into separare video segments (one for each song). This video is one of sixteen that made up that slideshow. I can’t share the other videos (they contain copyrighted music), but this one features Virginia’s daughters on vocals. It’s a family production: Virginia’s images, her daughters’ voices (Robin, Tammy, and Gwen), and my video editing. Somehow, it seems like a fitting farewell to a wonderful woman. Wow, so sorry for the bad news, J.D. It sounds like Virginia was a great lady, though, so her memory will live on as a wonderful part of your family. Hope you can keep enjoying your time in Turkey—your family is in my thoughts. I’m sorry to hear about your aunt. Her beautiful pictures helped create a loving tribute. Thank you cousin for this lovely tribute to mom. She sounds like an amazing woman, a wonderful example and will be greatly missed. I love the story of her newly wed life and she is so right, when you have each other you don’t need fancy gifts. Virginia’s life was a true example of love, and she will be greatly missed. Wow I am so sorry to hear about your Aunt’s passing. I did not know her. In fact, the first I ever heard of her was last week when I purchased two of her photos while I was at Multnomah Falls. I am from Pennsylvania and thought her photos a beuatiful keepsake to take home. We purchased one of the Falls and one of Mt Hood. She was a wonderful photographer and your story has given the photos so much more meaning. Sorry for your loss. She was a talented lady and I am grateful to have some of her work. What a wonderful personal legacy to leave to the world and to your family! I too am sorry for you loss. I purchased one of her photos several years ago and it has been hanging in my office ever since. It is one of thousands (or more) I am sure she took over her lifetime. It is beautiful and reminds me of home every time I look at it. It was of the Casselman Bridge in Grantsville, MD – a huge stone arch bridge built over 100 years ago to support the traffic heading out west on Route 40. Recently, I was noticing at how it has faded due to the constant exposure of sunlight. I looked her up today to see if I could reach out and get a new print. Disappointing, to say the least, that she is gone. I have sent this page to my facebook page so it will be easy to share her story with my family and friends from Estacada. When I was to be married in 1980, she was just getting started. Yet, once I described I wanted a cake with stair step tiers coming down, and a fountain, she said she would learn how to make it, have it ready, then set it up, even though we were getting married all the way in Hillsboro, Or compared to being close to her home in Estacada. The day before my wedding, was June 13th, 1980. Friday the 13th if you believe in bad luck. Mt. St. Helen’s blew and coated this entire area in ash during it’s second eruption. Even though the local news casters were calling this a catastrophe area, I never once had a call from her with any worry or bother to ask if I was still going to get married. If the roads were closed, don’t worry, no matter what, I could count on her to make it. And she did. She was the first person there, and the last person to leave. She gave my mother instructions on how to just bring the flower stands home, the cake plates and equipment from them home and she would pick them up in Milwaukie on her next trip into town. What a woman. She trusted our family to do the right thing without insisting we give her all kinds of deposits for the equipment she was leaving in her care. She had such a sense of calm dignity that she made you feel that way just being around her. I am Ted’s girl and virginia was my grandma and i hope this site is always here for me to come to when i get lonely for grandma. THANKS SO MUCH!!!! !